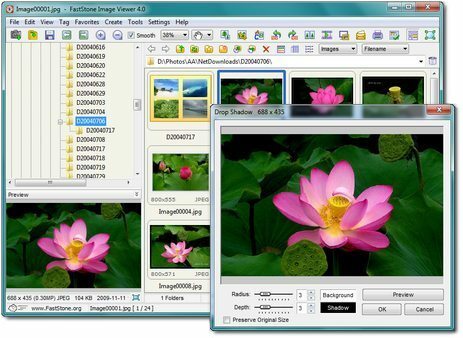 FastStone Image Viewer is a fast, stable, user-friendly image browser, converter and editor. It has a nice array of features that include image viewing, management, comparison, red-eye removal, emailing, resizing, cropping, retouching and color adjustments. Its innovative but intuitive full-screen mode provides quick access to EXIF information, thumbnail browser and major functionalities via hidden toolbars that pop up when your mouse touches the four edges of the screen. Other features include a high quality magnifier and a musical slideshow with 150+ transitional effects, as well as lossless JPEG transitions, drop shadow effects, image annotation, scanner support, histogram and much more. It supports all major graphic formats (BMP, JPEG, JPEG 2000, animated GIF, PNG, PCX, PSD, EPS, TIFF, WMF, ICO and TGA) and popular digital camera RAW formats (CRW, CR2, NEF, PEF, RAF, MRW, ORF, SRF, ARW, SR2, RW2 and DNG). For example, buried in Fastone Image Viewer is an option where you can scan documents and save them as PDF files. I personally use this all of the time to convert my paper documents to the digital PDF format. To get to this feature, launch FastStone Image Viewer, click on the File menu, and select Acquire Image From Scanner. You will then be taken to the Acquire Image From Scanner workspace where you simply click on the scan button to begin your scans. Typically, by default, this will launch your scanner software. You can scan single documents or perform batch scans were you scan one document after another. When done, select save and select the PDF Format option. Also, on an added note, you can also save image files in FastStone Image Viewer to the PDF format, as well. Very powerful image viewer utility that can either be installed or used as a portable app. SearchMyFiles is an alternative to the standard “Search For Files And Folders” module of Windows. I highly recommend that you use a password manager to manage and store all of the passwords that you use. Typically, most folks use the same password for many sites and accounts and are careless in maintaining their passwords; often storing them in and around the computer. KeePass will assist you in generating strong passwords and will assist you in securely storing your passwords. Also, check further on their website for ported versions of KeePass to other operating system platforms, such as Android. KeePass is available as a full install or portable app. Highly recommend this software (MiniTool Portable Partition Magic); especially, the portable version to manage disks and partitions on your Windows PC. Typically, this type of software is something that most people do not need on a regular basis; thus, the reason I recommend the portable version. Simply download, unzip and run; when you need it. As an example, I recently used this software to delete a partition and to extend the system partition to capture the space that was being used to store a Windows factory restore on an older HP laptop (that really no longer needed the restore files) that is now running Windows 10. In the end I gained 10GB of space and the computer runs more efficiently. Free download portable partition software – MiniTool portable partition magic to manage disks and partitions on Windows PC. FastStone Image Viewer Portable 6.5: View, edit and convert your image collection quickly and easily with this powerful tool… This image viewer is also available as a full install, as well. This is the software utility that I use to backup the files on my computer to an external drive. Once you set up the source and destination, you are good to go. Many options available (in plain sight) that makes this a great backup utility in preserving your files. DSynchronize is FREE and requires no installation. 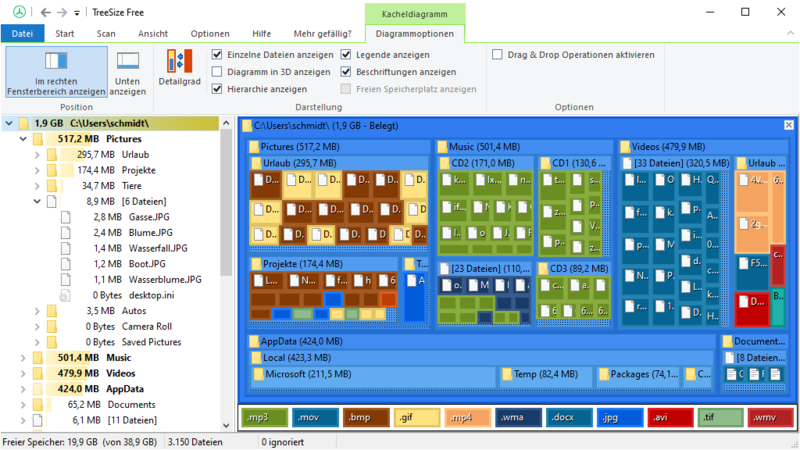 DSynchronize – Periodically synchronize two or more folders locally or remotely. The document scanning software that is typically found associated with the scanners that you connect to your computer is not very user-friendly (difficult to navigate). WinScan2PDF may be the solution you are looking for where you simply select your scanner (the source), click on “Scan To PDF” and save the file to your computer. WinScan2PDF is a very small and portable program that allows you to scan documents and save them on your computer as a PDF by using scanner! Here is a good Windows software option, called MailStore Home, that you can use to download and backup your Gmail. I can also see using this to archive a Gmail account that is getting full. MailStore Home is a free email archiving and email backup software for personal use. With MailStore Home you can backup all emails in a central archive, even if they are distributed across different computers, programs or mailboxes. You can do this either on your PC or on a USB drive as a “portable” option. AdwCleaner is one of those programs that I keep on my computer, that is engineered to target (and remove) adware, spyware, potentially unwanted programs (PUPs), and browser hijackers. If you download this program, you will have to manually run it in order for it to work its’ magic. There is no install involved (simply download and run). I typically download it and run it at least every couple of weeks. I have had great success with this program over the years and highly recommend it to help keep your computer in a healthy state. Quick Access Popup may be of interest to you if you are into increasing your productivity and like program launchers or an easier way to toggle between folders. This program, available as a full install or portable app, allows you to customize a popup menu to fit your own specific needs or you can stick with the folders already baked into the program. Below is a screenshot to give you and idea what the program is about and the ways it can be launched. I especially am in favor of the portable version that I can take with me from PC to PC. You can explore Quick Access Popup more by clicking on the source link below. One way to test the reachability of a host on the internet is to “ping” the IP address of the host or the hostname (i.e. http://www.google.com). When you perform a ping, it measures the round-trip time for the message to be echoed back to your computer. A nice little utility, with a GUI, is PingInfoView by NirSoft. PingInfoView is a small utility that allows you to easily ping multiple host names and IP addresses, and watch the result in one table. It automatically pings to all hosts every number of seconds that you specify, and displays the number of successful and failed pings, as well as the average ping time. You can also save the ping result into text/html/xml file, or copy it to the clipboard. Cleaning utilities, such as BleachBit, are great in freeing disk space, removing junk files, erasing your cache, deleting cookies and clearing your internet history. This all goes toward protecting your privacy. BleachBit wipes clean 90 applications including Firefox, Internet Explorer, Adobe Flash, Google Chrome, Opera, Safari, and more. Beyond simply deleting files, BleachBit includes advanced features such as shredding files to prevent recovery, wiping free disk space to hide traces of files deleted by other applications, and vacuuming Firefox to make it faster. Better than free, BleachBit is open source. It’s packaged in PortableApps.com Format so it can easily integrate with the PortableApps.com Platform. And it’s open source and completely free. Rip Audio CD to MP3, FLAC, APE, WMA, WAV files. This blog post is for the people out there that carry a tech toolbox. If you are one of those people, then I am sure you are familiar with the Windows trace route command (tracert). The traceroute command is a computer network diagnostic tool for displaying the route (path) and measuring transit delays of packets across an Internet Protocol (IP) network. To further enhance the use of this command I came across a FREE utility called TraceRouteOK that provides an easy to use GUI. To make TraceRouteOK portable, you will need to create in the TraceRouteOK working directory a file named TraceRouteOK.ini … Notepad can be used to create this file. If you are a computer tech, this utility (called Computech Windows Tweaker) may be of interest to you. Based on what I am seeing at the Major Geeks software download site, Computech Windows Tweaker is described as a “niche utility for anyone looking to hide or show drives, disable the Firewall, USB storage, UAC, Remote RPC, Security Center, Offline Files, and Action Center temporarily. It might also be able to re-enable these, especially after a virus or malware infection”. It appears (based on the version number) it is a relatively new app; which means, this will only get better as the development progresses. Also, I downloaded and found that this is a portable app. I have featured Glary Utilities on the blog in the past and thought I would do a re-visit to see where the program is at this time. Glary Utilities has been around for a long time and I have installed/uninstalled it many times over the years. Today, after looking at an interface that is new to me, I decided to re-install Glary Utilities and use it as my main system optimization and maintenance tool. One important thing I like about this utility is that you can download it as a portable app and keep it on your flash drive (tech toolbox). There is a FREE version of this software, as well as a professional (paid) version. The interface of Glary Utilities is super easy to navigate (with one click functionality) with options to perform maintenance options automatically. The program includes over twenty system utilities (such as a Registry Cleaner, Spyware Remover, Startup Manager and Shortcuts Fixer) and features a “Windows Boot Time Monitor” that will tell you how fast your computer starts up. This time is then compared with other Windows users. This is useful in determining if there is something causing your computer to lag at boot up. Glary Utilities, according to their site, is compatible with all versions of Windows. When you diagnose or repair a computer problem there are specific software tools that are readily available to help resolve those specific issues. Most techs will carry with them software tools on a stick (flash drive) to test, diagnose, fix, resolve malware issues, recover data, etc… You have to be knowledgeable of what software tools to download and where to download them from. This can be a problem when you are not familiar with these tools. The tools are categorized by their function, and the program will automatically download the correct version for the Windows edition in which you’re working. When you finish, simply uninstall the tool, and all downloaded software is also removed. Or you can choose the portable version of Windows Repair Toolbox, and just run it from a pen drive. – Ability to select several tools to run successively in unattended mode, in order to perform malware removal, system cleaning and repair, and disk defragmentation. A email letting you know that the automatic repair is complete, and containing the logs, can be sent to you. – Displays relevant information about the computer to be repaired: CPU temperature, name and % time; amount of RAM installed on the system and % of use; Disk model, capacity, rotation, SATA version, basic health check; amount of free space left in the system partition; Windows edition and install date; System boot time; and more. Noticed this morning a version upgrade to Any Burn Portable at FreewareFiles. Followed up by checking the official site. Any Burn is my favorite burning software due to its’ simplicity and the fact that there is a portable version that I can carry on my flash drive. AnyBurn is a light weight but professional CD / DVD / Blu-ray burning software that everyone must have. It provides a free and complete solution for burning and disc imaging. I love screen capture programs and I can tell you that Snipaste is a keeper. Simply download either the 32bit or 64bit version, unzip the file, start the application and press F1 to start snipping. You can also press F3 to paste whatever it is you snipped into its’ own floating Windows. Due that this program is a little different than what I was accustomed to when it comes to screen capture utilities, there was a short learning curve involved. Once I conquered that, I was very impressed with Snipaste (especially, its’ on-the-fly editor) and see where it will increase my productivity; especially, when using images in my blog posts. Due this program was a little different than what I was accustomed to when it comes to screen capture utilities, there was a short learning curve involved. Once I conquered that, I was very impressed with Snipaste (especially, its’ on-the-fly editor) and see where it will increase my productivity; especially, when using images in my blog posts. There are many good (FREE) software utilities out there to help fix specific problems with your Windows computer; however, you need to know where to find them. The Windows Repair Toolbox solves that problem by giving you a dashboard menu of choices to perform malware removal, system cleaning and repair, and disk defragmentation. These tools can be run successively in an unattended mode; and, when done, will send you an email (with log results) to let you know that the automatic repair is complete. You can even add your own software utilities to the Windows Repair Toolbox; however, from what I see that is included, they are some of the best out there. I do have to advise you, that when you use tools to diagnose Windows problems, you are doing so at your own risk; however, when your back is against the wall and you have run out of solutions, Windows Repair Toolbox may be that shot in the dark you were looking for. Windows Repair Toolbox is available as a portable app, which makes it nice for those who run around helping others with their computer problems. Download and run “on-the-fly” the best free portable software when it comes to diagnose and solve several kinds of Windows problems. The tools are categorized by their function, and the program will automatically download the correct version for the Windows edition in which you’re working. When you finish, simply uninstall the tool, and all downloaded software is also removed. Or you can choose the portable version of Windows Repair Toolbox, and just run it from a pen drive. Ability to select several tools to run successively in unattended mode, in order to perform malware removal, system cleaning and repair, and disk defragmentation. A email letting you know that the automatic repair is complete, and containing the logs, can be sent to you. Displays relevant information about the computer to be repaired: CPU temperature, name and % time; amount of RAM installed on the system and % of use; Disk model, capacity, rotation, SATA version, basic health check; amount of free space left in the system partition; Windows edition and install date; System boot time; boot environment. Is your computer running slower due to low disk space? If so, run the portable version of WizTree to determine where the space hogs are located. Just be careful in what you end up deleting. I am quite impressed with WizTree in the fact that it includes a visual treemap that allows you to spot large files and large collections of smaller files at a glance. TurnedOnTimesView is another tool from NirSoft that will provide you with the Startup Time, Shutdown Time, Duration, Shutdown Reason, Shutdown Type, Shutdown Process, and Shutdown Code of your computer. TurnedOnTimesView extracts this information from the event log on your computer. This information is useful in troubleshooting computer problems and can also be used to determine when and how long the kids have been on the computer after you have started it up. This utility, a portable app, works on any version of Windows, starting from Windows 2000 and up to Windows 10 (32-bit and 64-bit systems). For every time zone, the following information is displayed: name, description, current date/time in this time zone and date/time that daylight saving time begins and ends. Crystal Security, a cloud-based system that detects and removes malicious programs (malware), is new to me. I am currently testing the portable version and so far the interface part looks great (user friendly). The detection engine, from I am can tell, is based on data gathered from millions of participating users systems around the world to help defend against the very latest viruses and malware attacks. Due to not being familiar with Crystal Security, at this point, I will continue to test and use it solely as a troubleshooting application to inform when the possibility of malware exists. If you are familiar with Crystal Security, I would like to hear your experience with this. I do like the idea that there is a portable (no install) option. I do recommend that you know what you are doing when using applications, such as this; so as not to cause accidental havoc to your PC. SysGauge, a system and performance monitoring utility, available as a portable app, is a nice utility that you may want to consider for the tech toolbox. Appears to support all versions of Windows, XP to Present… Windows Server versions also supported. One notable feature of SysGauge that I was impressed with is the system analysis feature. Just press the ‘Analyze’ button located on the main toolbar and SysGauge will perform a quick system status analysis of your PC that will check the CPU usage, memory usage, the operating system status, the disk space usage for all disks and produce the results in a nice dialog summary. SysGauge is a system and performance monitoring utility allowing one to monitor the CPU usage, memory usage, network transfer rate, operating system performance, the status and resource usage of running processes, file system performance, USB performance, disk space usage, disk read activity, disk write activity, disk read transfer rate, disk write transfer rate, disk read IOPS and disk write IOPS for individual logical disks or all physical disks installed in the computer. If you are experiencing issues with your PC, Kapersky System Checker may help you resolve the issue. It is not designed to fix anything; but, is designed to give you a lead on what the problem could be… I look at this as another tool in the tech toolbox that may help you troubleshoot a range of problems such as: malware, missing updates, poorly configured Windows or application settings, a shortage of hard drive space, and more. Simply download and run. No install is necessary. Over the years, I have assisted people with their computers and have found that their Windows desktop becomes a haven for icons. Some folks are organized about it; but, most folks are not. Myself, I try to keep my desktop organized and the icons to a minimum. In addition, I use a portable app called “AutoHideDesktopIcons” to auto hide the icons after a set period of time. To simply reinstate the icons (make them appear again), I simply left mouse click the desktop. AutoHideDesktopIcons also has an option to the hide the taskbar and an option to autostart with Windows (which I recommend in order to take full advantage of this app). AutoHideDesktop Icons is very small in size (<60K) and is fully compatible with all versions of Windows. FastStone Image viewer is a FREE software application that I have featured quite a few times here on the blog. Anytime I set up a PC, FastStone Image Viewer is always on the list to be installed. I prefer this image viewer over the default OS viewer(s). Once installed, I set it as the default viewer. Recently, the software was upgraded to include an internal video player, enhancements to the drawing tool, improved support for high bit-rate mp3 in slide show; and, some minor improvements and bug fixes. FastStone Image Viewer is available as a full install or portable app. Powerful image editing tools: Resize/resample, rotate/flip, crop, sharpen/blur, adjust lighting/colors/curves/levels etc. Noticed a version upgrade to “Any Burn” that prompted me to do a quick post. I currently use the portable version of Any Burn and it has never let me down. As a matter of fact it is my go to burning application on my computer. What I like about it is that it is very easy to use and understand. Quick Access Popup – Speed Up Your Work With This Multi-Purpose Launcher and Folder Switcher! From day one I have enjoyed working with various program launchers in creating menus to launch my favorite and/or most used programs. With that being said, Quick Access Launcher is right down my alley. I first saw this on Major Geeks and thought I would give it a try and share this find with you. Where this little program will come in handy for me is that I can install this on my flash drive as a portable app and will enable me to quickly launch the apps and web links I have on the drive. If you like program launchers, I encourage you to take a look at this one (see video below for an overview). music2pc – This program is as easy at it gets. Enter whatever it is you are searching for and it will most likely be found. I noticed on their download page you have an option to download a version where a YouTube downloader is built in, which is the version I downloaded. music2pc – Is also available as a portable app. Built on a very fast and safe non-bittorrent and non-peer-to-peer method of getting MP3s, the program gives you the ultimate access to our multimillion database of quality mp3 songs. Search and download over 100 million MP3s for free. TweakPower is an all-in-one suite that has been designed to keep you and all your family’s computers running at optimal speed and efficiency. TweakPower is an intelligent software tool that allows users to fine-tune their operating systems and programs for optimum performance. TweakPower protects users from PC problems, while increasing the performance and security of their computer. TweakPower includes advanced performance optimizers, helping you achieve super-fast application load times, work faster and make your games run smoother. Now it’s easier than ever to get a clean PC. TweakPower can quickly remove Windows, program and browser clutter while refreshing your registry and deleting massive disk space hogs. Also, its easy-to-use wizards and diagnostic tools help you find vulnerabilities and errors on your computer. I currently use Dsynchronize at work and at home to back up (and sync) my files. To learn how to use Dsynchronize, I suggest you set up a small test environment to practice using the program. It is very easy to use, once you get the hang of it. The thing that fascinates me with the program is that it is very fast. I have been using Dsynchronize for several years and it has never let me down. First saw this on the DownloadCrew… A nice ping tool for the tech toolbox (portable app) where you can detect by sound (like a heartbeat) when things are slowing down. BPing is a tiny console-based ping tool with an unusual extra: sound. Sounds odd, but double-click the program and you’ll understand immediately. By default the program immediately pings Google.com and plays a sound (from Space Invaders!) every time a reply arrives. This is a good portable app to scan your home network (and work network) to determine what devices are on the network; and, can also be used to detect intrusions or devices that should not be on your network. Reliable and free network scanner to analyze LAN. The program shows all network devices, gives you access to shared folders, provides remote control of computers (via RDP and Radmin), and can even remotely switch computers off. It is easy to use and runs as a portable edition. It should be the first choice for every network admin. What a clipboard manager does is capture and archive your “copy / paste” operations. If you are looking for one with a ton of features, then check out ClipAngel (see source link below). If you don’t believe me, check out the feature list below. ClipAngel is an open source program that is a portable app. Treesize FREE is software that is engineered to quickly scan the directories and files on your computer to tell you (in a nice GUI layout) where the spacehogs are. TreeSize FREE, as of Version 4.0, now offers the hierarchical treemap chart known from TreeSize Professional. The treemap will help you visualize how the data is distributed on your system. The treemap feature is activated by using the “Show Treemap” button on the “View” Tab. TreeSize Free now uses the ribbon interface known from other applications like the Windows 10 Explorer or MS Office. TreeSize Free is now available via the Windows Store, replacing TreeSize Touch. TreeSize Free now uses a modern UWP-style layout for the touch-optimized UI. Overlay menus and the new “Options” dialog increase the usable workspace. The touch-optimized UI will now present itself windowed and can be moved/resized like other store apps for Windows 10. The recently scanned paths are now available on the touch-optimized UI. The scaling for displays with high DPI values for both, classic and touch-optimized UI has been improved. The scan performance of mobile devices has been increased significantly. TreeSize Free now supports selecting multiple elements in the directory tree for mobile phones and cameras. Bugfix: Corrected the column layout in printed reports. It should now use the available size of an A4 page with portrait format. Bugfix: Several minor bug fixes and improvements have been incorporated. Here’s a visual aid to tracert currently free at Softperfect. You can use this to see where internet delays are happening with a website. This tool comes in portable and with an installer. This is the portable version of WSCC at Download Crew… WSCC is a great way to quickly access the tools at NirSoft and Sysinternals; as well as various Windows Tools. To learn more, click on the source link below. I am really impressed with this portable tech toolbox called Windows Repair Toolbox (see source link below); and, can see it as a real asset to anyone who assists others that are experiencing computer problems. The developer has created a dashboard of sorts that will assist you with downloading the necessary tools to fix or troubleshoot a PC. Most of the downloaded tools will land in a downloads folder that is a subfolder of the Windows Repair Toolbox folder (which keeps everything together in one place). There are some downloads that are full downloads (for example, Malwarebytes Anti-Malware). Another nice feature is that you can add your own custom tools. (Almost) everything you need to repair Windows problems in one small handy tool. Source: Windows Repair Toolbox – (Almost) everything you need to repair Windows problems in one small handy tool. Here is a program called System Restore Point Creator that is available as a portable app that I can see being part of your tech toolbox. Create and manage System Restore Points quickly and easily, all from a free simple program. No more drilling through multiple menus in Windows just to create a System Restore Point, now all you have to do is run this program and that’s it. Follow the simple program layout and you have your System Restore Point created in no time at all. Found this on BetaNews that looks interesting… It is called Pastextra. It is a tiny Explorer extension which enables pasting clipboard text or images directly to a file, no extra steps required. This is useful if you are into saving images or text that you need to preview later. The program has no installer, but it’s easy to set up manually. Extract the archive to a safe folder, run Pastextra as an administrator and it registers itself on Explorer’s right-click menu. The majority of home based computer users use the same passwords (or easy to remember passwords) for nearly every account that they are subscribed to. Hacker’s (or criminals) know this and take advantage of these facts. If your password is easy to remember, then it is easy to hack. To make your accounts secure, it is HIGHLY RECOMMENDED that you use a password manager to manage your accounts and the passwords associated with them. The “go to” password manager that I use (on all my computers and devices); and, have used since its’ inception is the “S10 Password Vault”. It has never let me down… The main feature I like about this software is that I have total control over my password information at the local level. There are so many features to the S10 Password Vault that I encourage you to visit the developer’s site by clicking the source link below.S10 Password Vault is available for Windows as a standard installer and as a portable version that allows you to run directly from a USB drive (which then also contains your data file). There is also an “S10 Vault” mobile companion app for iPhone/iPad (in the App Store) and for Android devices (in the Google Play Store and Amazon App Store).